Wahoo! I must say "Wahoo"! I had so much fun creating this Valentine concoction! It made good use of my always-ready Paper Seedlings thinking cap. You see, I've been a happyhappyhappy Paper Pumpkin subscriber for quite some time now. Many times, when I get the monthly kit, I do not use all the components that come with each kit. This leaves me with lots of cute little supplies. These leftover supplies are all separated and stored for future use, i.e., embellishments together, stickers together, stamps together. Well, you see where I'm going. And all these little goodies are stored in their own bright red Paper Pumpkin box. A happy stack of Paper Pumpkin boxes is enough to bring an anticipatory smile to anyone's face. Well, I have been looking at that happy stack ever since we moved into our "new" house, almost two months ago now. Over the weekend, I finally came to the decision to use up some of these leftovers. One of the kits that I had never gotten to use yet is the one with the little pie-shaped boxes, because it came right in the middle of all the packing/moving turmoil. 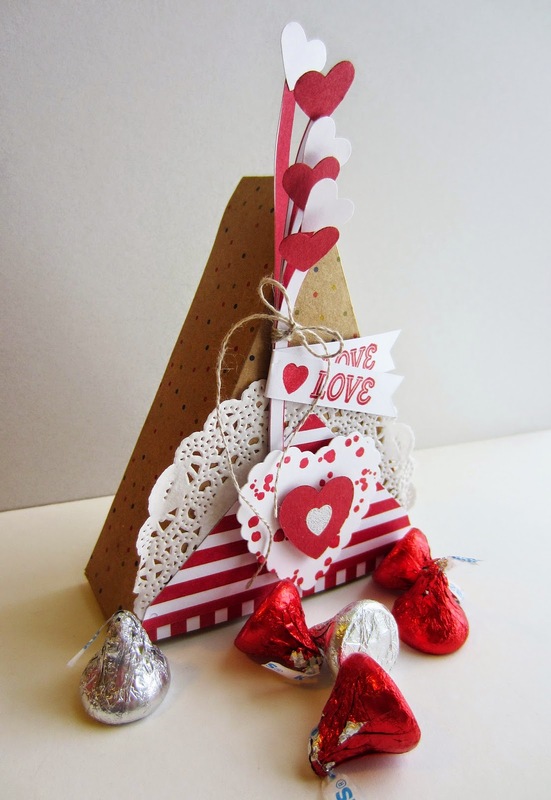 Picking up one of the triangular boxes, I realized that it would make an adorable container for Valentine treats. I then proceeded to embellish one as such. As I accumulate the wonderful stamps that come with each monthly kit, I stamp each image in Marina Mist on one of two sheets: images and sentiments/words. (Actually, the latter of the two sheets has expanded onto a second sheet.) It is easy to lay out these sheets and gaze at ALL the Paper Pumpkin stamps I have available for me to use. For this project, I chose the blotchy background stamp on the larger heart, the small heart stamp on the center of the red heart and on the folded-over LOVE banner. The LOVE stamp came from another earlier kit. The red-and-white striped pieces were two of the "blades" from the pinwheel kit. The "pole" that supports the six small hearts is created from another of the blades from the same pinwheel, simply by cutting six of the red and white strips apart, then stacking them together. I added the red and white punched hearts to each of these strips. The partial doily was left over from another project, as was the hemp twine and the banner that is folded in half. The only things I added from my own personal stash were scrap pieces of Real Red and Whisper White cardstock, from which I punched the little hearts. 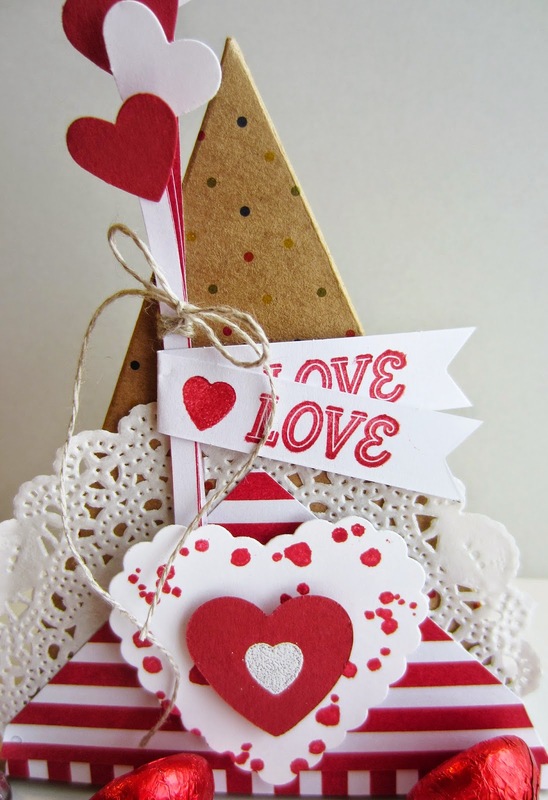 And I used the Hearts A Flutter Framelits to create the two larger hearts from the rest of the scrap cardstock. I know this piece is just a tad over-the-top. But, isn't it fun??!? How do you use the leftover components from your Paper Pumpkin kits? 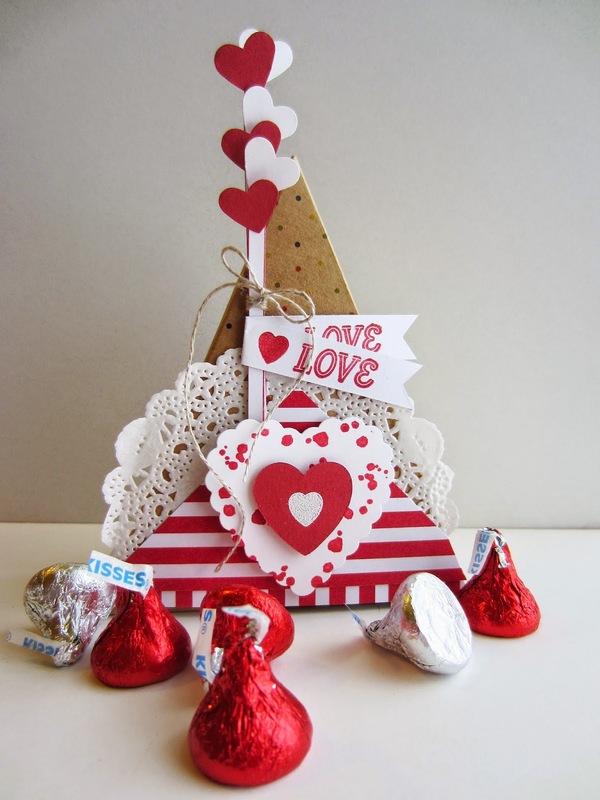 Do you ever create a "mashup" like I did with this Valentine treat box? JUST A SIDE NOTE: I received my January Paper Pumpkin kit in the mail just yesterday, a few days after I created this project. After opening the kit, I was struck by all the wonderful stamps that would have been ideal to use in this project. However, then I wouldn't have been forced to be as creative as I was in choosing from the non-Valentine stamps I had accumulated thus far. Paper Seedlings to the rescue! Wahoo! I haven't played much with my kits, but I love what you do with your leftovers! I love this, its perfect for Valentines, thanks for sharing on Friday Features this week and please stop by for The Oh My Heartsie Girls WW!! !